A friend of mine from World of Warcraft is going through a rough patch. The love of his life is going to school 6 states removed from him. They aren't going to marry until she has finished her Masters and has a job. A worthy goal. He's in a job he marginally likes, no, tolerates, because it provides for the necessities; beans and franks, gas, rent on an apartment, Internet access and health insurance. He has decided that going back to school to follow an interest he has will, in the long run, yield the kind of happiness and security he seeks. He's taking steps to get into the program he wants and will pick up a few classes this fall at a local community college. The program he wants will mean quitting his job and moving to a new climate in a state 4 states north of where he currently lives. It will mean going from an 8 hour drive to see his mom and brother to a 12 hour drive. He will be closer to his love as she winds down her degree. Sounds good, right? Sounds like he has a road map for where he's going, right? On the surface. Underneath, he's so very unsure about everything. He has a deep, abiding belief in God and how God is leading him. It's just that the human side which does not like surprises and wants to be in control of the situation sees so many missing pieces in the above scenario that he has made himself sick. Conversations with him have me philosophical about my own life. My road, particularly of late, has been anything but smooth. It's easy to see the road only and not the life around the road. I know I fail at that but I try. I was giving him this image in the hopes that it helps him. I can't take credit for this. I learned it when I was in therapy as my marriage fell apart. My wonderful therapist, Nancy, had developed this theory. I have found it holds true the more mileage I put on my life. These are the stages of dealing with what life offers you. I offered this last July, but in an abbreviated form. You walk down the road and fall into a deep, huge pothole you didn't see and can't get out of. You walk down the road, see a huge, deep pothole ahead. You fall in and can't get out. You walk down the road, see a huge, deep pothole, try to avoid it, but fall in and can't get out. You walk down the road, see a huge, deep pothole, try to avoid it, but fall in, yet get out. You walk down the road, see a huge, deep pothole and avoid it. You walk down the road, see a medium-size pothole, fall in but get out. You walk down the road, see a small pothole and trip over it. You walk down the road, see a bump and wonder that you ever thought it was as big as the road. You walk down the road admiring the view. If you've followed me since before October's financial fiasco, you can probably see where I've been on the journey as I deal with the potholes. Yup, I fall in. I can fall in, a lot. There are times where I don't feel I can get out. But, in the end, it turns out that what I thought was a huge, horrible hole from which I would never emerge, was a bump in the road. That's what I've laid out for him. Right now, I would say he sees the pothole and sees it as a wide expanse of black. He could get around it but he's scared he's going to fall in and not get out. If he falls in, all is lost and this course he has charted out for himself gets lost. From my point-of-view, he's looking at a baseball-size hole in the road and I'm wondering why he's staring at it. It's hard, when you're struggling with things, to see them as bumps, blips or baseball-sized holes in your road of life. When you're struggling, everything gets magnified. I can spend hours in the bathroom crying over what is perceived to be a road-sized pothole simply because I've hit a rough patch. To be sure, there are stretches where your road is not a 6-lane, concrete surface devoid of cars where you can floor it and test the limits of you. There are days when it resembles the road to the left, muddy, wet and nearly impassible. How can I go on when it's like this? The best advice I can give him, and me, is that this is temporary and there is beauty to be found in the mud. As much as I know all of this, things happen that skew my perspective. 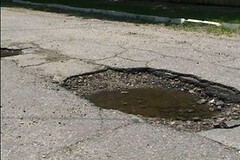 The pothole is not the blip in the road you see. It's a whale of whopper, feet deep and impassible. There is no way around it! Why can't you see that? I'm just going to sit here until someone fixes it. I told him that it's okay to wallow. It's okay to feel sorry for yourself. Get it out of your system. I don't know when it was, maybe some time in April after the last problem with my checking account and the $74 overdraft fee, but I woke up one morning and realized that these were just baseball-sized holes. I do my best and go on. I fall in or trip over them, to be sure, but they aren't deep and I can get out. He will be fine. He has a plan and a direction. Maybe he should look at the sides of this pothole in which he finds himself. There might be something interesting on the walls.